Using the width between the Bollinger Bands called BandWidth, this system finds times of low volatility also known as a squeeze. It is called a squeeze because as the bands compress, they tend to expand again into higher volatility and the price can trend along the upper or lower band. 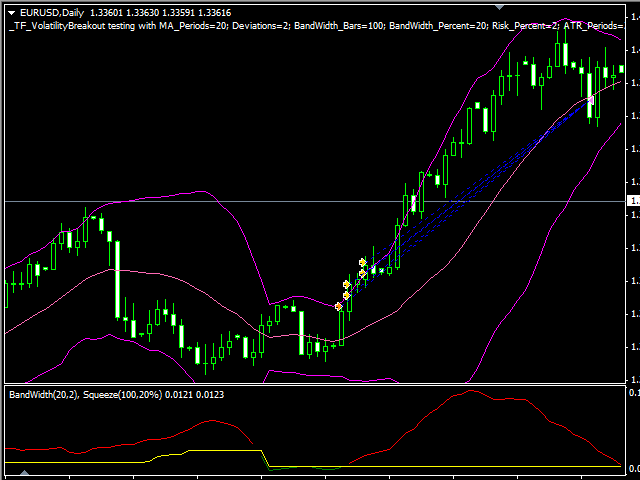 This system finds low volatility and enters a new position when the price moves to the upper or lower Bollinger Bands. The SMA used to create the Bollinger Bands is used as a trailing exit. After the price follows the upper or lower band, it returns to the middle of the bands to the moving average and the EA exits the position. This EA uses Percent Volatility position sizing to be able to treat any symbol or tick value the same to keep losses small with a fixed risk percentage as the lot size is calculated with the stop. If the price moves in favor of your position, additional lots are added (optional via input) as the system pyramids. This EA will only close positions that it has opened (only matches to its magic number). John Bollinger mentions the squeeze in his book, Bollinger on Bollinger Bands, and on his website. There are times when the BandWidth can be low and the price moves to one band but then quickly moves to the other band. John calls this a headfake as it causes a whipsaw with the squeeze. As the Bollinger Bands squeeze in low volatility, this EA enters a new position when the BandWidth is within the BandWidth_Percent threshold and the price equals or exceeds the upper or lower Bollinger Band. 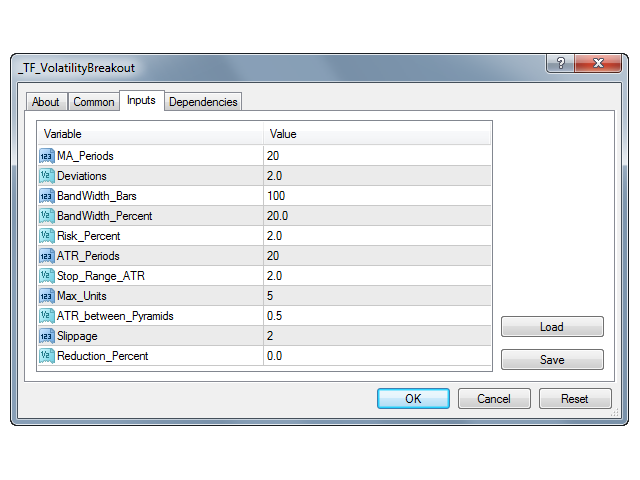 Using the BandWidth_Bars input, you specify how many bars back to find the lowest BandWidth value. Using the BandWidth_Percent input, you specify how close the BandWidth needs to be to the lowest BandWidth to allow a new entry. If you set the Max_Units input above 1, additional entries will occur and pyramid in ATR increments specified by the ATR_between_Pyramids input. Exits are trailing with the simple moving average in the middle of the Bollinger Bands. For long positions, the EA exits when the price goes below the moving average. For short positions, the EA exits when the price goes above the moving average. The exit is only active when the BandWidth is outside of the entry squeeze threshold. 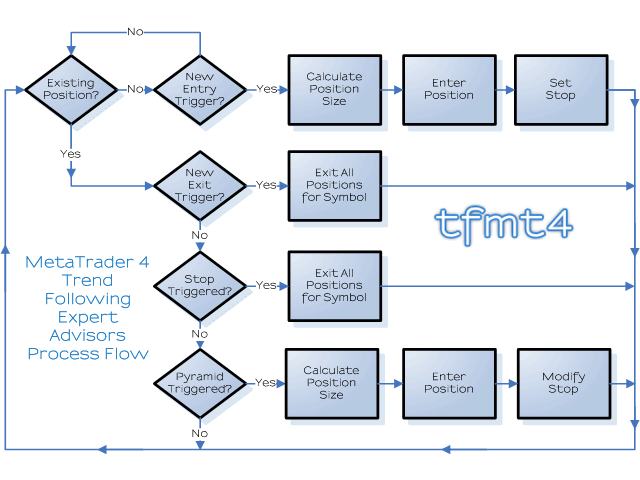 By having this additional BandWidth criteria, it prevents exit when the price is moving in the close range of the squeeze when only the stop is needed if the price moves against the position. MA_Periods: The number of bars used to calculate the simple moving average in the middle of the Bollinger Bands. Deviations: The number of standard deviations used to calculate the upper and lower Bollinger Bands. BandWidth_Bars: The number of bars back to find the lowest BandWidth value. BandWidth_Percent: The percentage to add to the lowest BandWidth value. If you want the squeeze threshold line to be 20% above the lowest BandWidth value, enter 20 to this input. The chart screenshot shows the Bollinger Bands in pink. Our BandWidth Squeeze indicator is also shown in the secondary chart window with the squeeze threshold line in yellow and the BandWidth in green when the EA can open a new position as the price reaches the upper or lower band.